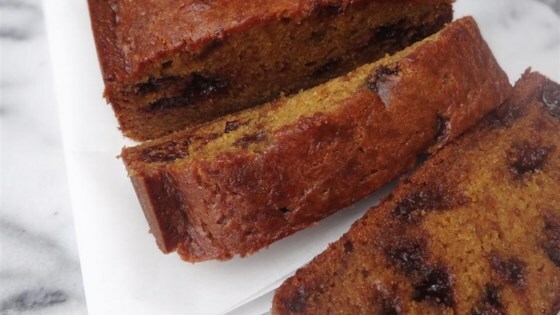 "Moist flavorful pumpkin banana bread." Preheat oven to 350 degrees F (175 degrees C). Grease and flour two 9x5-inch loaf pans. Mix sugar, pumpkin puree, flour, mashed bananas, oil, eggs, baking soda, nutmeg, cinnamon, allspice, and cloves together in a large bowl. Pour in water slowly, mixing until batter is well blended. Bake in the preheated oven until a toothpick inserted into the center comes out clean, about 1 hour 15 minutes. Cool in the pan for 10 minutes; turn out onto a wire rack to cool completely. It's good but next time, I'd add a little salt to it. Other than that it came out good. The consistency was good as well. I just made a large pan instead of 2 loaves. It was moist and delicious! I couldn't find one of my 9x5 pans, so I used one 9x13 pan and baked it for 55 minutes. Thank you for this recipe it will be a staple at our house. I've had this identical recipe for years, making it as just pumpkin bread. Adding the bananas makes it even better!! Make two loaves, the first will disappear quickly!